I agree with Jeffrey. Making games is not an easy thing to do, and even some of my crappy things that you can get on GameJolt caused me to feel like giving up. This happens to everyone at some point(s). If this is just on pause, then that’s fine (The Poppytales has been for nearly six months). Anyway, you should take a break. This process of making games can be stressful and make you feel hopeless, however it’s worth going back and trying to finish your projects. I thought no one would like the first Poppytail originally because that art was absolutely atrocious and I was going off mostly trial and error to see what would work. But I didn’t give up and a few people have enjoyed it and maybe some of the other ones too (even though this looks a lot better than those first four). There's more to the game than art make a great game engine.. as in code all the things you need for the game minus the art. do art as you go? Last? Or hire someone cheap to make the graphics. It's easy to get discouraged when you see great results from people who make art, programming, design, etc. look easy. When people post their results, you don't usually see the missteps, discouraging moments, and effort that went into them. In my little journal thread I like to show both successes and failures, because the latter is an important part of the creative process that's not always shown. Most of the time you just see a screenshot, demo, etc., when everything is working. So when you look at other people's work, keep in mind what processes aren't shown or what the authors may not be saying. re: art: I think there's room to scale back the art in your game dramatically without affecting the overall game too much. You spent a lot of time on one room. First impressions count, of course, but I find it helpful to work on general things first, then details. 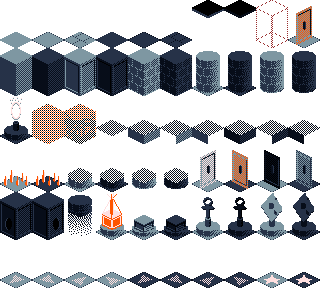 For example, this is the tileset for the original Temple of Idosra. It took less than a day to make (I had a tight deadline), and I was able to make an entire game out of it. I've added more tiles to it as I've moved along, and that's something you can do, too. Make your walls and floors as tiles that you can use in multiple places, then maybe think about details. Every time I've started at the detail level and tried to work outward, I've burnt out before getting very far. I probably shouldn't have written a post while I was feeling like crap yesterday. I don't want to give up. I'm just feeling down. It's really encouraging to see the support of you guys, though, thanks. I'd say my number one strength is finding the most complicated way to code something. Otherwise, I'd say that I'm not too bad with Stencyl. I just don't really see any "strengths" in me. I'm just an average-Joe nobody. Anyways, I'm going to keep working on this. Thanks again guys. Sometimes I just need to shout out everything I feel. this is the tileset for the original Temple of Idosra. That is one cool looking tileset. I'd like to point out to one of advises that Bombini recently posted about " -14. If you do quit, scale down, not up. " I believe here lies the key to success for us beginners. I myself have quite a struggle because of the size of my current game and I might have bitten more than I can chew (Woodwarf sequel). Big projects can become paralyzing because the finish isn't anywhere on horizon and anything we do seems just like a tiny drop in an ocean. I think it is critical to finish and launch at least one or two small games before attempting anything bigger. In my case I got very motivated by Stencyl game jam. It pushed me forward to make a small but functional game (Quarrel Hill) within a single week. That game itself isn't very successful, but publishing it made me learn so much. I learned something about what does game design mean in general and what does it mean to me. I learned about uploading processes, Flash portals, game icons, game description "selling points", scoreboards and such. About feedback and audience, how to deal with really bad reviews. Got connected with other game devs, enjoyed great cooperation with other artists, received crucial help from fellow Stencylers - both technical and friendly supportive. I didn't learn much about marketing, still trying to avoid that lol. I only discovered Twitter is a nice place for creators of all sorts. What I want to say - the game dev is far more than just creating phase of the game. The sooner you experience all aspects of the whole process, the better. That is why we need to create more small games. First I heard about the whole idea of keeping your scope small was at Extra Credits on YouTube. I recommend all their game dev related episodes! If you would have some questions, feel free to hit me up any time (best to my Gmail or Twitter). Now get back to drawing board and create a nice small game! Go! Go! I'm just an average-Joe nobody. What's so bad about being average? Trying to be better than other people puts way too much pressure on yourself. I always struggle with feeling like my stuff isn't good enough and I know one of the best things is stopping feeling like I'm supposed to be special. There's nothing wrong with being a "nobody", trying to be "somebody" is a waste of energy because it doesn't actually make people any happier when they succeed, maybe only fleetingly. Honestly there's nothing wrong with even making terrible garbage that no one likes. It's necessary for every artist of every kind. You're being far too hard on yourself. Your sprites are awesome. Thanks guys. I feel a lot better today, and I'll probably get back to work on the game again soon. Take a break if you need a break from this project or start something smaller. You will be surprised how much you like your staff after taking a break. I finally managed to get the down sprite working, and I just translated that over to the up sprite, so now all the walking animations are done! This is just a rough look at how it'll work because I'm too lazy to set up my own walking script right now: I just threw all the animations into the eight-way movement behavior. That made my day, especially since I'm just one guy. I made a very rough draft of the main character's portrait. I'm starting to lean towards Lian as a name for her. As I said, very rough. Lian sounds like a good name to me. I had a hard time seeing her on my laptop screen... maybe add some more contrast between her hair and face?